Here is a list of best free Remote Desktop Manager Software for Windows. These software come into handy for IT administrators to view, control, and manage multiple computers from a single computer. Task of walking up to multiple terminals for software deployment, maintenance, etc. can be avoided with these software. These remote desktop manager software give you a fixed point from where you can carry out the tasks mentioned above, along with various other tasks on multiple computers. These software can be used at organisational and enterprise levels, and are free to use. You may need to install some of these software on both viewer and remote PCs, while some only require installation on the administrator PC. You can view, control, and manage multiple remote computer either in tabs or in separate windows using these software. These software let you add multiple PCs for quick access. Some of these remote desktop manager software provide various quick access tools along with full access to computers. Some only give full access to remote computers with shared Clipboard and some basic tools. According to the options provided and limitation of the mentioned Remote Desktop Management freeware, you can choose which one will suit your needs the best. Go through the article and will get to know about these software in brief. I like Litemanager the most because of its intuitive interface and the tools provided by it. The tools give you quick access to various options and tools available on the remotely connected computers. Demo module has been provided as well for you to learn how to manage remote desktops using this software. Desktop Central is another good Remote Desktop Management Software for enterprise level because of the advanced patch & software deployment and other capabilities. Read below to know more. LiteManager is a free desktop manager software for Windows. It lets you manage multiple Windows desktops from Windows, Mac, Linux, Android, and iOS devices. You can easily establish connection with devices to be managed and carry out various tasks. This includes Full remote control, View monitor, File transfer, Shutdown, Task Management, Screen recording, and more. You can also use LiteManager to Chat or checkout some more enterprise chat messengers. The free version of LiteManager restricts the number of clients to 30. It provides unlimited access and can be used for personal as well as commercial purposes without limitations. 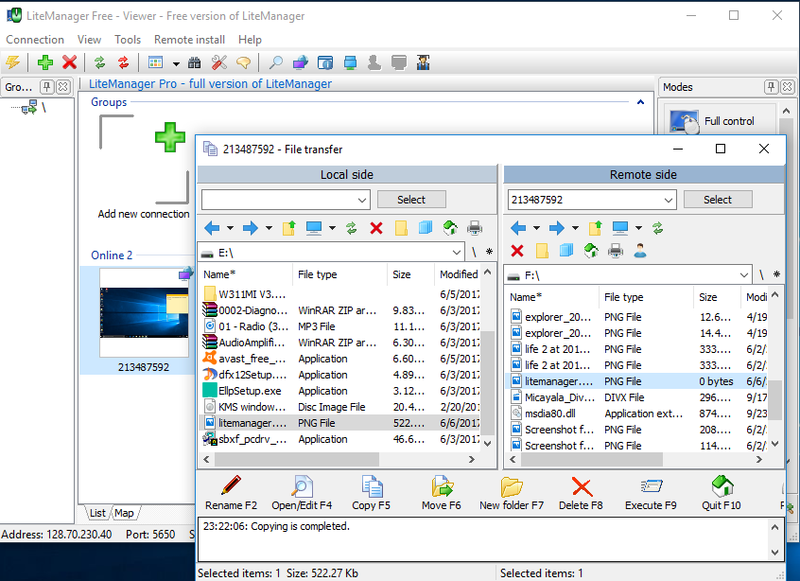 There are two installation modules for Windows: LiteManager Server and Lite Manager Viewer. The Viewer module has to be installed on administrator PC, while the Server module can be installed on PCs to be managed or administered. Connection can be established via client IP address or ID generated via this software. Password protection can also be set to establish connection. Once a device is connected, you can fully control it, or perform various tasks that are mentioned above. Another good feature of this software is its remote installer, which lets you install software remotely. Demonstration or Teacher mode is also available to show you how to manage desktops using this software. Although the demonstration module is available, you might not need to view it, as this tool is very easy to setup and use. RemoteUtilities is another good remote desktop management solution available for free. It has almost all desktop management tools available in LiteManager, with some additional tools, such as Remote webcam access and Voice & Video chat. The general desktop management tools available are Full Control of PC, View only, Power control (shutdown), Registry access, Chat, Screen recorder, Ping, Remote software deployment, etc. Also, the interface is easy to access and work with. The free version lets you add unlimited operators and a maximum of 10 remote PCs for management. Although there is a limitation on numbers of PCs that can be remotely managed in free version, there is no limit on the usage of features and tools provided. You can use it without restriction for commercial purposes. The download file of RemoteUtilities contains Server and Client installation modules. Server needs to be installed on PCs, while Clients are to be installed on Administrator (Viewer) devices. You can also manage computers from your Android or iOS devices, and app installation files for both are available. Connecting a remote PC to viewer client is easy. It can be done via IP address, generated ID, or DNS name. Depending on the security options set on server terminal/remote terminal, the connection may require password authentication to establish connection. While making a connection, you can choose if you want full access or action specific access of remote PC. All the connected devices are displayed on the dashboard on the controller PC. From here, you can directly access all the tools available. RemoteUtilities remote desktop manager software supports a wide range of languages, making it easy to be used by organisations worldwide. Some of the supported languages are: English, German, French, Dutch, Spanish, Chinese, Arabic, Italian, Japanese, Korean, Portuguese, Turkish, and more. Desktop Central is a free desktop management software from Manage Engine. Basically, it is an integrated desktop and mobile device management software, and works efficiently across multiple platforms. It lets you manage Windows, Mac, Linux, Android, and iOS devices. Desktop Central is one of the best software for enterprise desktop management. You can carry out various enterprise level desktop management operations, automate tasks, and do much more. It lets you automate patch deployment and software deployment, manage software licensing, limit USB usage remotely, assist or take control of computers via remote desktop connection, transfer files, record sessions, shutdown computers, and carry out various other tasks for swift desktop management. The free version of Desktop Central remote desktop manager is fully functional, but is only suitable for small organisations. With support to 25 computers and 25 mobile devices, Desktop Central can be upgraded to various paid plans offered according to organisation size. Advanced IP Scanner is a simple yet amazing software to manage desktops. What it does is, it scans for computers available in a LAN and lets you manage them. You just have to enter a range of IP addresses and carry out the scan. All the detected PCs are listed, which you can easily manage. You can carry out the following operations on remote desktops: Explore shared files, Copy name/IP/MAC, Shutdown, Ping, Transfer Files, and Remotely control PC. You can even export the list of PCs detected once the scan is complete. To manage and carry out operations on any PC from the detected list, right click on it to access the menu containing all the options. You can also rename a computer. 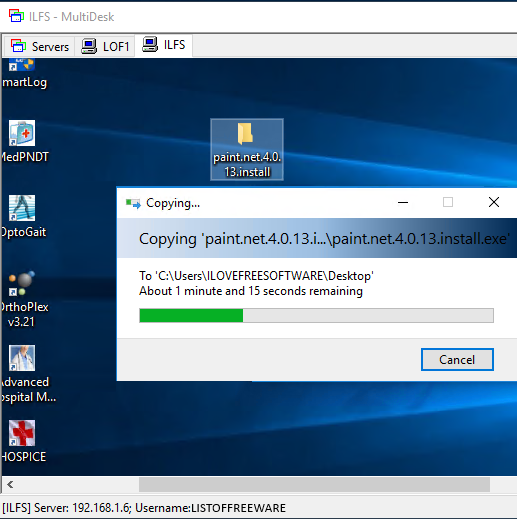 For Remote desktop connection, this freeware uses RDP. 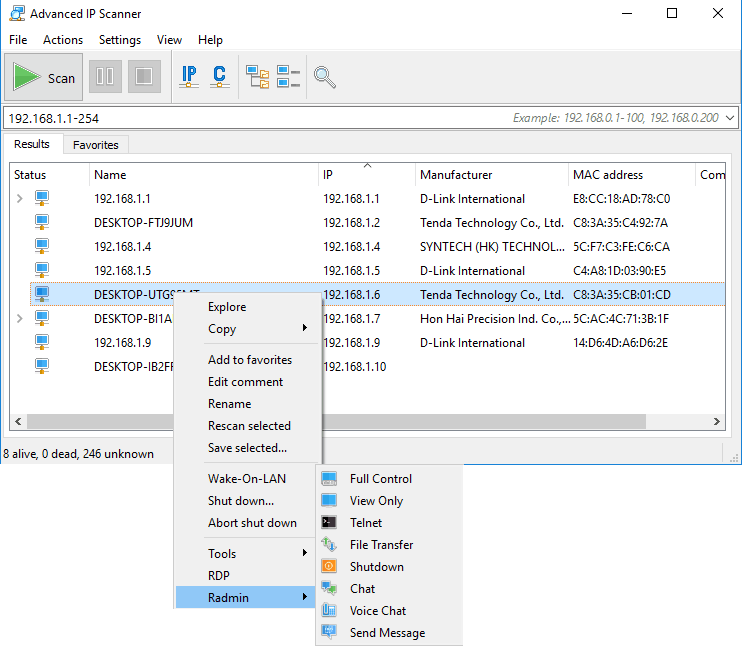 You can also make Advanced IP Scanner work with Radmin (a paid remote desktop connection utility), which you will have to install separately. It is a quite unique software and can turn out to be pretty helpful for some users to manage remote desktops. MultiDesk is a very simple yet useful remote desktop manager software. Here, you can add PCs to manage individually or in groups. You can access multiple computers in tabs and there is no limit on the number of connections or functions. The connections established between computers and administrator requires IP address, username, password, and of course, working internet connection. You can use this software on unlimited number of computers. You just need to install it on controller (viewer) PC. The remote computer requires no installation. To add a PC individually, use the Add Server option. You can create a group and add servers to that group, or add servers to already existing group. As mentioned before, you can easily add servers (remote computers). Note: Once you connect to a remote connection and start a session, the remote PC will lock itself out on the main unit side. If a user logs in on the remote PC while remote connection is active, the remote session will end. Talking about its functionality, you will not find options for quick access to various tools on remote PCs. So, once a remote connection is established, tools have to be manually looked for and used. You can easily move items (copy and paste) from viewer to remote PC. This can lead to easy data transfer or even software deployment. MultiDesk can be used a free and lightweight software to manage remote desktops without many advanced options. mRemoteNG is an open source desktop manager software. It lets you add multiple desktops in tabs and manage them simultaneously. It lets you connect to remote desktops over various connection protocols. It is again a very simple software with not many tools available on board. This free remote desktop management software is pretty basic, just like MultiDesk, and can be used for free without any limitations. You can use it to manage as many remote PCs as you want. The software only needs to be installed on the administrator or viewer PC. Once installed, you can choose one of the various connection protocols to establish connection with remote PC. The connection protocols available are: RDP, VNC, SSH1, SSH2, Telnet, Rlogin, RAW, HTTP, HTTPS, and ICA. You can use different protocols for different connections. This software also locks out the remote computer when a connection is established. Some of the tools available here let you Transfer files via SSH, access External Tools, Scan Ports, and Component Check. Other than these, no tools are available for quick access to options on remote desktop. You will have full control on remote PC, and can easily transfer files via shared Clipboard. You cannot add a connection shortcut for quick access to remote PC the next time. For this, mRemoteNG lets you save a connection as XML file, which can be opened again. 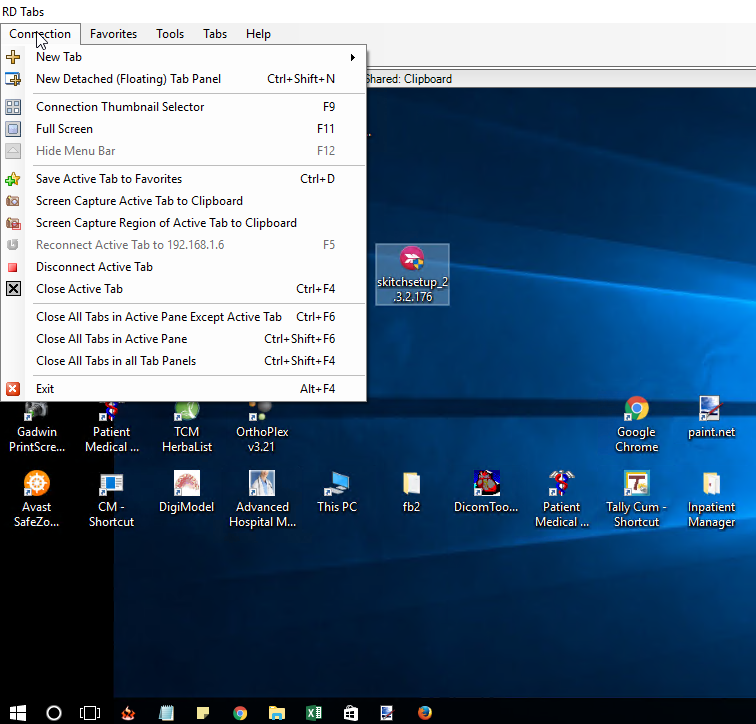 RD Tabs is a tabbed Remote Desktop connection manager, which can be used as a free Desktop Management software. 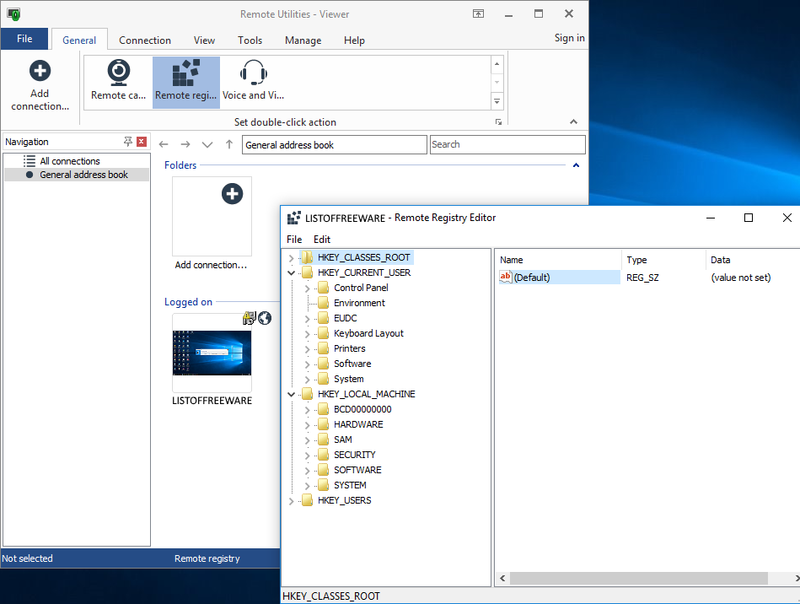 You can manage multiple remote desktop connections without any restrictions with this freeware. It’s easy to use and like MultiDesk, you will not find many tools here for quick control and management of remote desktops. RD Tabs is a complete freeware and you can use it to manage as many remote PCs as you wish. You just need to install the viewer client on the administrator PC. No installation is required on the remote PC in order to establish a connection. 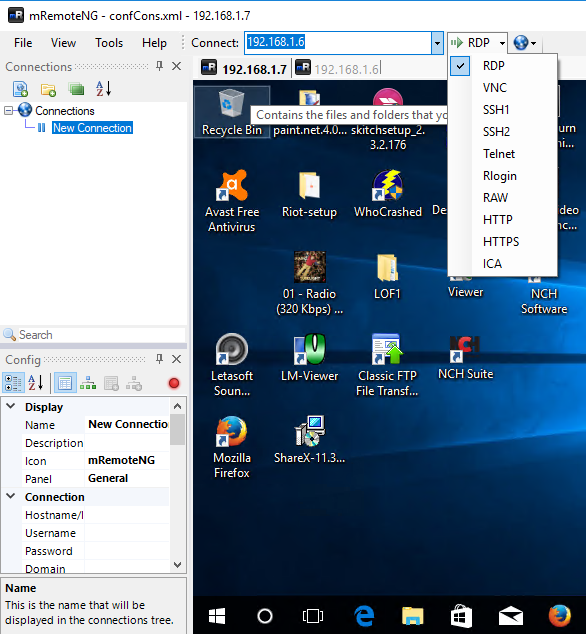 As RD Tabs uses Remote Desktop Protocol connection to create connections, you will need remote desktop’s IP, Username, and Password. Once connected, the remote computers will be locked out and administrator will get access to it. Before establishing remote connections, you can set display parameters, or gain/restrict access to sound, key combinations, clipboard, printers, serial ports, etc., and set other advanced options. According to the set parameters, you get access to remote computers, and you can manage them easily. If the clipboard is shared, then files can be transferred without any issue. Unfortunately, no tools are available to give you quick access to certain options on remote desktops. Connections can be saved to quickly access it again whenever required. Remote Desktop Connection Manager is a free remote Desktop Management software offered by Microsoft. It also uses Remote Desktop Protocol to connect and manage multiple remote computers in tabs. It has few options to perform certain actions on the remote desktop, making things easier for you. These options let you open Task Manager, Start Menu, Switch windows, Take Snapshot, Run command, etc. Connection can be established with the help of remote desktop’s IP address, Username, and Password. You just need to install the Remote Desktop Connection Manager client on the administrator PC. After connection is established, the remote desktop can be saved for easy access in future. You can either add individual computers, or create groups and add computers in groups. You can fully access the remote computer along with shared Clipboard. Apart from the tools mentioned above, you will not find other advanced tools to manage remote computers. Remote Desktop Connection Manager from Microsoft is a good and reliable option that can be used for free. If more tools to quickly access various options in remote computers would have been made available, this would have been one of the most preferred remote desktop management software out there.